“What an AMAZING Happy Yoga event today at Life Time in Colleyville! 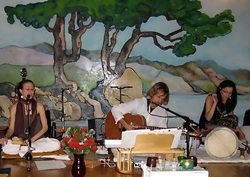 Live music by The Sound and the Meaning, and over 50 yogis!!! “Thank you, The Sound and the Meaning, so very much! You made the kick off to Gold's Gym Dallas Yoga's first year of workshops an experience the students will never forget. I'm grateful you all are in my life and so connected to what IS.